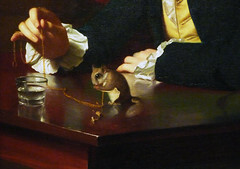 By the time the 1770s arrived, John Singleton Copley was the undisputed king of portraiture in the American colonies. Yet despite this fact, he had longed to visit the Old World, and he had, in fact, received much encouragement to permanently move to London. 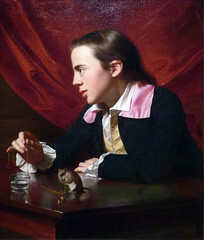 Copley’s early masterwork Boy with a Squirrel, a portrait of his half brother Henry Pelham, had been shown at the 1766 Society of Artists exhibition. Many artists, particularly Benjamin West and Sir Joshua Reynolds, had been suitably impressed with the artistic virtuosity of the New World wunderkind. West, himself a colonial, wrote to Copley on 4 August 1766 to encourage him embark on a Grand Tour of Europe. With his creative spelling, West urged Copley to make a “viset to Europe for this Porpase for three or four years, you would find yourself then in Possession of what will be highly valuable” (this and all quotes use the 18th century spelling). We found Mr. Copley dressed to receive a party of friends at dinner. I remember his dress and appearance—an elegant looking man, dressed in a fine maroon cloth, with gilt buttons—this was dazzling to my unpracticed eye! —but his paintings, the first I had ever seen deserving the name, riveted, absorbed my attention, and renewed all my desire to enter upon such a pursuit. In a city—Boston—that was becoming increasingly more divided between the Tories and the Whigs (those who preferred loyalty to Britain and those who wished for independence, respectively), Copley remained as apolitical as he could. Indeed, a look at his Boston patronage indicates that he painted sitters on both sides of the growing vitriolic political divide. But as the 1770s progressed, Copley’s life became more and more uncomfortable. Most of his wife’s family were strident Loyalists. His father-in-law Richard Clarke, for example, was the owner of the tea that provoked the Boston Tea Party on 16 December 1773. Several months later—April of 1774—an angry mob arrived at Copley’s home looking for Colonel George Watson, a Tory lawyer Copley had painted in 1768. This unruly event frightened Copley and helped him realize that the political climate was beginning to get out of hand. “What a spirit!” Copley wrote on 26 April. “What if Mr. Watson had stayed (as I pressed him to) to spend the night. I must either have given up a friend to the insult of a Mob or had my house pulled down and perhaps my family murthered.” Fearful for his own safety, Copley sailed for London in June 1774, just seven weeks later. His family—wife, children, mother, and half-brothers—remained in Boston. Copley’s passage across the Atlantic lasted until the second week of July, and he wasted little time in visiting Benjamin West, Joshua Reynolds, and the Royal Academy of Art. After some time in London, Copley began his continental Grand Tour, an eighteenth-century staple of art education for an aspiring painter. He first visited Paris—writing to his wife on 2 September—then made his way to Rome via Genoa. Copley arrived in Rome on 26 October and spent the next seven months viewing art and architecture and copying the Old Masters. He also made several side trips to Naples, Pompeii, Herculaneum, and Paestum. In just fifteen months—that is from his departure from Boston to his return to London from the continent in October 1775—Copley had received nothing short of an art education unavailable to anyone in North America. He was primed to open a painting studio in London. By the time he returned to London, his wife and three of their (then) four children were awaiting his return (the youngest, Clarke Copley, born in 1775, did not travel with the rest of the family and died the following year). Copley thusly flipped the page to a new chapter—the English Chapter—in his professional life. The Copley Family shows the six members of the artist’s clan as it existed at the beginning of 1777. Copley has shown three adults—the artist, his wife, and her father—and his four children. As was typical with group portraits that included a self-portrait—see Raphael in The School of Athens and Smibert’s self representation in The Bermuda Group, both of which Copley would have seen—the artist looks directly at the viewer, a look of inquisitiveness on his visage. He holds a set of drawings and leans on a classical plinth. His father-in-law, Richard Clarke, looks to the viewer’s right, seemingly unaware that the youngest daughter, Susanna, is attempting to climb onto his lap. Sukey, shown in profile, lovingly nuzzles John Singleton, Jr., their only son, while Mary, on the far right, attempts to capture her mother’s attention. The only other sitter who seems alerted to the viewer is the oldest, Elizabeth, who stands seemingly unaware of the happenings behind her. Although Clarke seems more aloof than loving, the rest of the participants in this stage-like setting seem to express tenderness and love for one another. Children play and vie for motherly affection. Sukey plays the maternal role of a loving and tender parent. Elizabeth, the oldest, suspiciously stares at the viewer as if facing a stranger. Copley demonstrates—as he had so consistently in Boston—a keen ability to paint psychologically rich and complex compositions. These are not only accurate likenesses of those who he most loved. Indeed, Copley is able to tell us, through visual means, a bit about who they are. 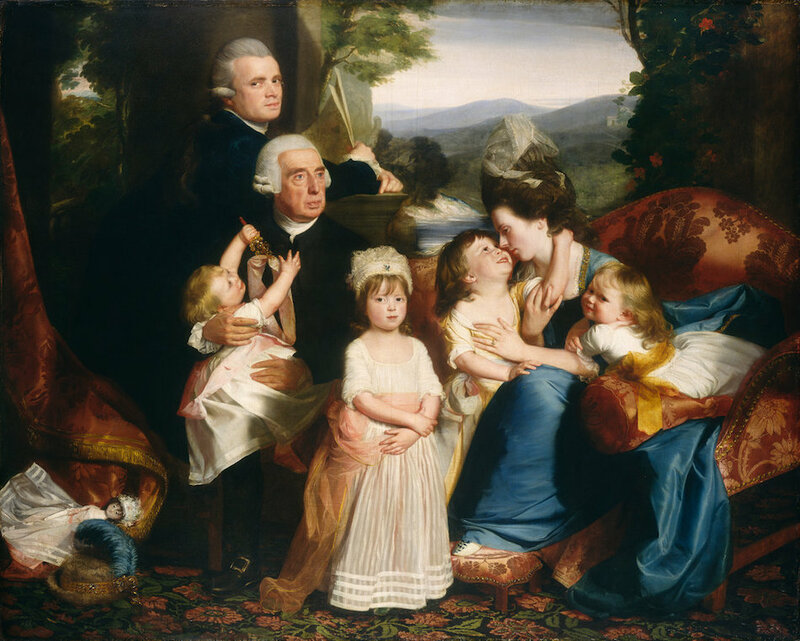 However, this portrait was not only intended to accurately record who the Copley family was and what the Copley family looked like at a particular moment in time. Instead, Copley completed this work as a way of both advertising his talents and abilities as a painter, but also to announce his family’s formal arrival into fashionable London society. Copley and his wife wear clothing then at the height of fashion, and this attire, in addition to the drapery on the left of the painting and the extravagant furniture and beautifully rendered carpet, dually speaks to the artist’s affluent wealth and his ability at painting fabrics. The drawing he holds, the vase behind his hands—identified as a copy of the Medici Vase Copley would have seen in the Uffizi while in Florence—and the Italianate landscape in the distance that appears as if borrowed from a Raphael Madonna and Child painting all proclaim his Grand Tour pedigree. In size (6’ x 7.5’), composition, and in artistic references, Copley intended for this group portrait to eloquently advertise that his newly arrived services were available for hire to the London portrait-seeking public. Copley exhibited this work at the 1777 Royal Academy show to nearly universal acclaim. In a career that would extend for almost another forty years, this painting is the only one he formally exhibited with his own likeness within it. Clearly, the work is not only about what it is, but also who made it. The artist achieved his goal. One critic remarked, “Mr. 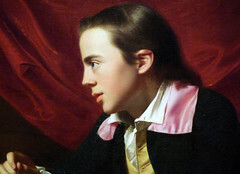 Copley, from the size of his family piece, is likely to be as much the subject of observation in the rooms as any artist who has exhibited…” Years later, in 1792, Copley had achieved such fame that he was set to rival his former advocate, Benjamin West, for the presidency of the Royal Academy of Art. Between The Copley Family in 1777 and the end of his career, the artist shifted his attention from portraiture—which had been his only focus in the American colonies—to that of the more prestigious and ambitious history paintings. Cite this page as: Dr. Bryan Zygmont, "John Singleton Copley, The Copley Family," in Smarthistory, August 9, 2015, accessed April 22, 2019, https://smarthistory.org/copley-the-copley-family/.